Benny Doesn’t Like to Be Hugged (2017), written by the brilliant and prolific Zetta Elliott and richly illustrated by Purple Wong, is a sweet and accessible story about the relationship between a boy with autism spectrum disorder (ASD) and his sister. At the end of the book, Elliott provides a detailed note about her investment in creating inclusive children’s books. She discusses wanting to write a book about autism with a Black male protagonist because society takes such a punitive stance on Black boys. The beautiful brown-skinned children Wong illustrates, as well as the diverse cast of characters both children interact with throughout the story, are wonderfully inclusive of different abilities, religions, and races. 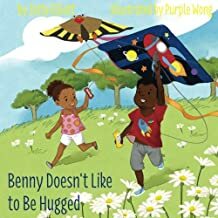 Benny Doesn’t Like to Be Hugged is a much needed text that celebrates difference and subtly shatters stereotypes while introducing a young autistic boy to readers through the eyes of his loyal and loving sister.The story begins with descriptions of Benny’s enjoyment of grapes and toy trains. The narrator then explains Benny’s reactions to various social situations. For instance, at school Benny likes to play with “quite kids.” He is shown working cooperatively, and silently, with two peers, as a group of diverse students are glimpsed through the window playing tag and basketball. Besides trains and grapes, Benny has other, more particular likes and dislikes. He doesn’t like hugs, wrinkled clothes, or sprinkles on his cupcakes. But, Benny is smart. His love for space is introduced on the cover where his t-shirt and kite both depict rocket ships, and within the story through a description of his knowledge of stars. Along with many likes and dislikes, Benny has behaviors that may be confusing for children unfamiliar with ASD to understand. He cries in music class because the noise is too loud and is depicted twirling in circles by himself on a field trip to the zoo. He doesn’t always laugh at jokes and can get very upset over seemingly little things. Bright full-page illustrations make this a wonderful addition to classroom libraries, and simple sentences make it a great choice for early readers. We need more books about autism, and this text is accessible even to very young audiences of three or four. I highly recommend Benny Doesn’t Like to Be Hugged for home or school libraries and see it working well in classrooms with children 4 to 7 years-old.